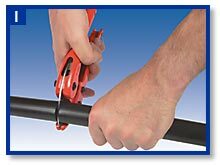 Cut the PE Pipe (Polyethylene Pipe) square with pipe cutters, knife or saw to the required length. 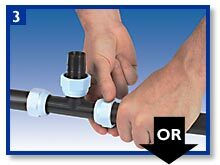 Push the HANFLO fitting on to the pipe, up to the housing of the white circlip. 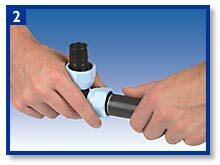 Wind the nut on to the pipe by hand until tight and nut is fully engaged against white circlip. 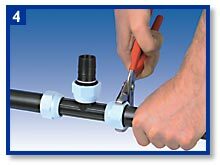 Tighten nut with wrench until nut is fully engaged against white circlip.